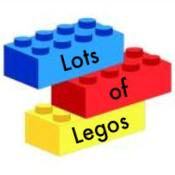 We sell Lots Of Lego. All of our Legos are in excellent clean condition unless otherwise stated. Every effort is taken to insure quality pieces. Pictures in the listings are always the item you will receive. Looking for a particular piece? Just ask and we may have it. LotsofLegos doesn't have any items in their booth! Great customer service and prompt shipping of a hard to find item. Product arrived in excellent condition. Would buy from again. Thanks for the legos!